As part of a series to explore the famous roads of cycling, here is the Planche des Belles Filles in France. The idea with this series is to discover the road and its place in the world, whether in cycling’s folklore or to explore what it is like on a normal day without a race. 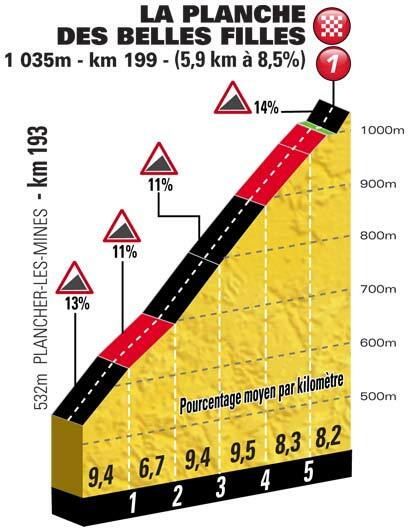 The Planche des Belles Filles is a novelty that first appeared in the Tour de France in 2012. According to several sources it will be back in 2014 and it could well reveal the podium contenders once more. But for now it’s an unusually steep road that leads to a small ski station with a controversial past. The D16 splits to the north of Plancher Les Mines, the junction is obvious and signalled by a large sign. The road climbs already to the junctionbut from here the climb is 5.9km at 8.5% but frequently goes into double digits, especially after a milder section early on. The ride finishes with a 20% ramp to the small ski station. A triangular road sign says it all: 13% for 5.6km. A mini Zoncolan although it has a recovery section one third of the way. The steep slopes are harsh and will have you reaching for your lowest gears right from the start, the first ramp is 14% for several hundred metres. Most French roads are carefully engineered with regular slopes but this is the exception, a constantly changing in gradient yet invariably steep. But the road is wide, two cars can pass with ease. With regular sections at 12%, riders in the Tour are happy to use low gears and compact chainsets. There’s a short recovery section mid-way and some of the hairpin bends are wide allowing for a rider to seek refuge from the slope on the outer line but otherwise this is a relentless climb. It’s wooded and the foliage means there are few views on the way up, just a strip of black tarmac rising ahead. The finish section is over 20% and it’s from here that the views are better. There’s a sign marking the finish line of the Tour de France and it tells you Chris Froome’s time of 16m11s… over a minute quicker than Laurens Ten Dam’s Strava record. It’s possible to ride up and down without meeting anyone else. The road is a dead-end unless you’re on an MTB. Consequently you’ll be alone for most if not all the climb and maybe it’s for the better given the steep slopes. The exception is the annual finish for the Trois Ballons cyclosportive when participants face its steep slopes with over 200km in their legs. In winter the road is open as the small ski-station requires the road to be open for access. There are three ski-lifts and more XC ski trails. If anything there are more reasons for locals to visit in winter although at just over 1,100m above sea level the snow can’t be permanent from December to March. If you’re lucky you might spot a rider in FDJ kit. 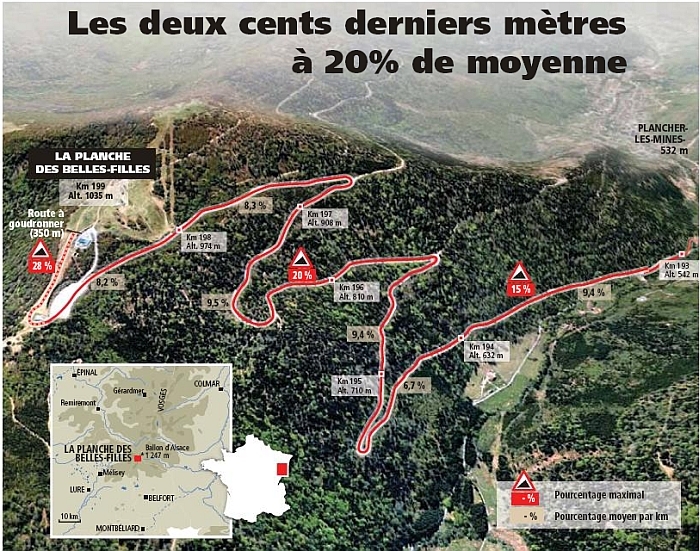 It’ll probably be Thibaut Pinot who lives 10km away and this is “his” climb that gets used for training efforts and fitness tests. The Pinot family is part of the region, Thibaut’s father is mayor of a nearby town. It’s the contrast with the Tour that’s notable. This climb might not be legendary but it is crucial. 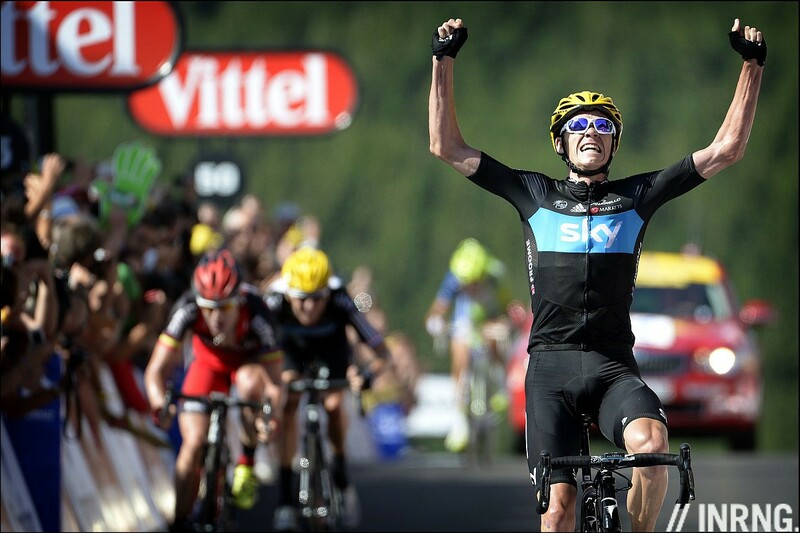 It was the first summit finish of the 2012 Tour and quickly showed how Team Sky were in control with Chris Froome winning the stage with Bradley Wiggins close by whilst many other pretenders for the overall were floundering. Now it seems it’ll feature in the 2014 Tour after a weekend in the Vosges, the first summit test. Legend says some beautiful girls, the belles filles, threw themselves into a lake on the mountain rather than face Swedish invaders in 1635. But the hill has been covered in beech trees which were called fahys in an old dialect so it’s the belle fahys or nice trees. The peaceful setting is cherished by locals to varying degrees. Some protested at the landscaping work done in order to host the Tour de France in 2011 but the station at the top remains modest. The protest was not new, plans to create a ski station on top of the mountain were launched in the 1970s and met with some opposition, notably “SOS Vosges” which so violently set on preserving the peace that it resorted to using explosives to blow up ski-lift pylons. The Vosges mountains are probably not on your radar of roads to ride. Which is precisely why you should think of riding here. This is a peaceful area with some unique roads. Unlike the Alps or Pyrenees where the mountains often form an impassible barrier it’s possible to ride many different loops from one base, all while notching up several mountain passes a day. There are higher, harder and better roads than the Planche des Belles Filles. 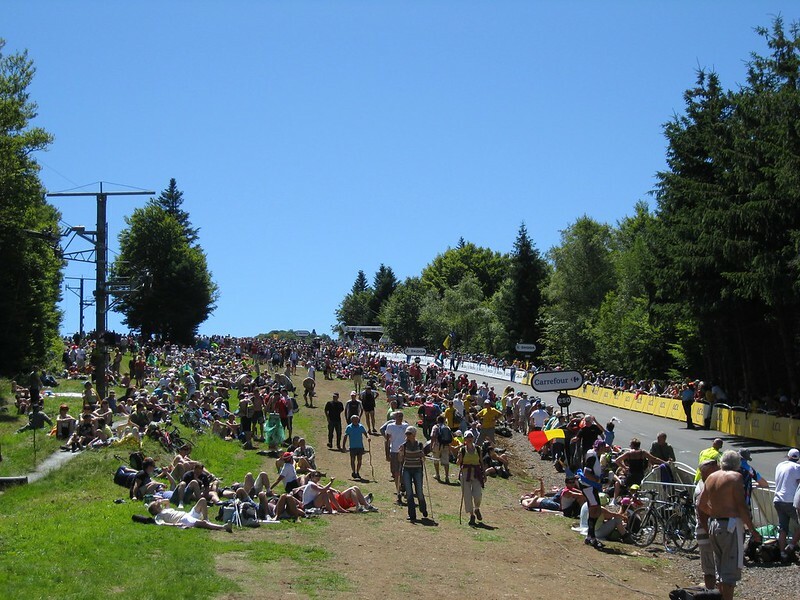 The Ballon d’Alsace, the first ever real mountain road taken by the Tour de France back in 1905, is the next mountain. Of course many will skip the Vosges and go to the Alps but Belgians, Brits and Dutch driving to the Alps would do well to stop here for a couple of days and explore. The peace and quiet comes a cost. It’s not so easy to reach this part of the world. 400km east by south-east from Paris, the closest big city is Basel in Switzerland. Dijon and Besançon are near and it’s frontier area where connections to Germany and Switzerland as as good as France. Main photo by Flickr’s Collideous. The region is easy to reach (Basel airport is just 20+km away from Mulhouse..) and definitely one of the best training regions in Europe! Many pros live in the area, just across the border to Germany or Switzerland. You can ride for hours on dead flat roads in the Rhine river valley in winter or have climbs of all lentghs and difficulties in the Vosges with virtually no cars (big advantage compared to many roads in the Alps! In spring, you can ride your bike in shorts in the valley and ski the same day on the slopes, where there is usually plenty of snow until March! Great food and nice landscape complete the picture! Definitely worth a ride! Did I miss something? The profile graphic says 5.9 kms @ 8.5% but in your piece you write about a sign with 5.6 kms @ 13%. Does that first 300 meters go almost straight down? The former sounds like a not-so-tough climb on average while the latter sounds seriously nasty. Hauled my fat a__ up the Mortirolo again in July 2013 but we’ll ride (weather and other conditions permitting) the Zoncolan for the first time in 2014. The sign says 13% for 5.6km but it really means some 13% stretches for the next 5km. It’s warning enough and the 8.5% average is flattered (flattened even) by a near flat section after about 2km. I was there on holiday last year. A very pleasant place and some nice, and challenging riding. I can also recommend the area a little further north around Gerardmer. It does get rather busy in high summer, though. Nonsense. Only true if you see things through the centralistic French view, where everything has to be routed via Paris. And to be noted: If you have done all climbs in the vosges, you can just cross the border to Germany (30km) and you have a very similar mountain chain (Black Forrest) on the German side with equally good riding.. Agreed and when I visited in 2012 the roads were good and there were some train options too. But I’m trying to think of the international traveller, perhaps an American or Australian visiting France on a flight to Paris or a Brit or Dutch cyclist driving to the Alps; it’s certainly a detour and Basel airport isn’t full of long-haul connections. But it’s worth the detour and the 2014 Tour looks set to show the Vosges to the rest of the world. Strasbourg has an international airport too, directly connected with main European capitals. Is that original? It’s very good. It’s mentioned that it’s a nice zone to base yourself , for those of us who are foreign to that region which towns are we talking ? Good question. The region has had an industrial past and there are still some car plants but they’re on the slide. So a few places vibe decline. Belfort to the south is a nice place, scenic to visit. Gérardmer to the north, a likely place on the 2014 Tour route, is called the “pearl of the Vosges” and scenic. Neither are big places, you can start riding in the town and be in the hills in 5-10 minutes. Gerardmer is a good option. Very scenic, nice lake, in the middle of nature. If you are looking for a bigger town, try Colmar further north or any of the surrounding villages. Most have small hotels and you are in the hills within a few Kms. Such a crazy looking ride. We don’t have the best scenery here in Arizona for our rides – looks like it’s time for me to convince my wife that it’s time for a road trip next time we have a biking outing! Think you’ve got your century wrong! Never again! I did this at the end of the Trois Ballons and it was cruel to see so many walking up. What’s the food like in this part of France? There’s a lot of cheese, you get some Swiss-style dishes like cheese fondu and to the north there is the pizza-like flammekueche. But plenty for the cyclist concerned about their power-weight ratio too. Note that the Strava segment mentionned ends at the bottom of the last steep part (the part after the parking lot, especially paved for the TdF). So the times of Froome and Ten Dam can’t be compared one to one.